The California Chamber of Commerce is the largest broad-based business advocate to government in California, working at the state and federal levels for policies to strengthen California. 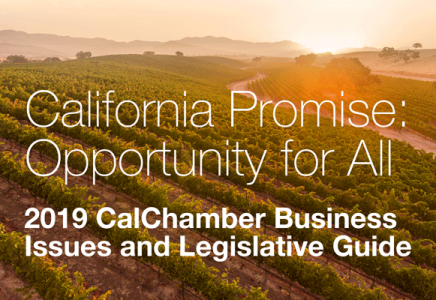 The CalChamber policy team brings energy and experience to the task of making sure lawmakers and regulators hear about the impact of proposals on business and the state’s economy. Policy advocates testify regularly at public hearings of the Legislature, state agencies and regulatory bodies on a broad array of issues and topics affecting how California businesses do business. In addition, the CalChamber policy advocates are deeply involved in behind-the-scenes meetings and discussions, helping shape proposed laws and regulations to streamline government and improve the jobs climate. To explain CalChamber positions, policy advocates send letters on state legislation and regulations. We also release an annual list of job killer bills that would have a negative impact on California’s economy if they become law; job creator bills that will encourage employers to invest resources back into the economy and their local communities; and track select federal bills. CalChamber through its political action program has an excellent track record in getting pro-jobs candidates elected to the Legislature. The Public Affairs Council and network of coalitions and political action committees (PACs) work in concert to ensure that the voice of the employer is heard on legislative issues, ballot initiatives and candidate campaigns—both in support and opposition. .Our members trust us to pave the way for a healthy business environment. Working together, the CalChamber and local chambers of commerce are a solid force as advocates for business-friendly policies and helping California businesses comply with complex laws and regulations. It is more important than ever to ensure that the business viewpoint receives a thorough airing when controversies end up in the courts. The CalChamber Legal Affairs Department participates in major litigation that affects California employers, and files friend-of-the-court briefs to emphasize the impact that judicial decisions would have on California’s economy. International Affairs includes global resources and contacts, Trading Partner Portals, trade issues, federal legislation, and information about the import/export business. Recent CalChamber trade missions and business/policy trips include Canada, Chile, China, Cuba, Germany, Israel, Japan, Korea, and Mexico.